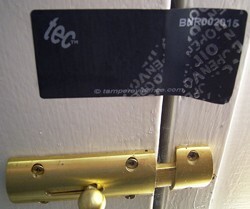 Voidtec (NR) is an easy to apply, self adhesive tamper evident security seal or void label. Upon removal it delaminates to create a highly visible void message, leaving no adhesive residue on the application surface. Transfers no adhesive residue to application surface. Manufactured from tough polyester with high tack adhesive. Creates a highly visible void message upon attempted removal. 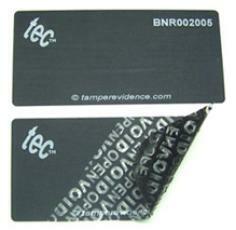 Suitable for applications requiring no surface contamination (DVD cases, vehicle doors etc). Strong and durable for outdoor application. Unique serial number for easy identification and verification. Allows authorised signature for additional verification. Thermal transfer. pre-printed with logo/text & sequential numbering. Custom printing available with name/logo and numbering. Aircraft door & hatch security seals. Vehicle door & window security seals. Hotel / conference facility door & window security seals. CD / DVD case security seals. IT equipment, warranty void seals etc.